Delikon EMI shielding Heavy Series Over Braided Flexible conduit and Heavy Series Fittings protect rolling mill automation control system cables. Critical industrial networking applications can not afford data transmission errors that cause downtime or safety concerns. Delikon Heavy Series Over Braided Flexible conduit and Heavy Series Fittings increase their ability to withstand the harsh conditions of industrial applications. From heavy series over braided liquid tight conduit to EMI termination connector, Delikon flexible conduit solutions guarantee maximum uptime, premium performance, and superior durability. For the tasks of switchover from the obsolete control system to the new automation controller for Roughing Mill, Delikon EMI shielding Heavy Series Over Braided Flexible conduit and Heavy Series Fittings prove to be the best cable protection solution. The stainless steel braiding protect automation cables against molten Metal Splash, Slag, and Sparks as well as provide emi shielding to the electrical and data cables of the automation system. The heavy series connector provides a continuous grounding path and a full 360 degrees effective shield termination of the braiding. 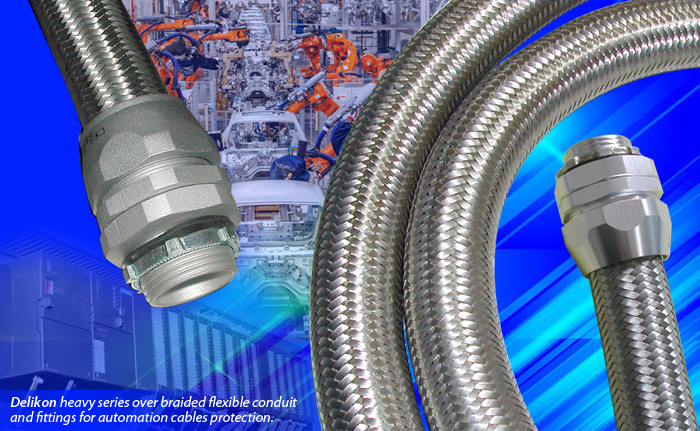 Delikon EMI shielding Heavy Series Over Braided Flexible conduit and Heavy Series Fittings are designed for use in the environment of industrial applications.